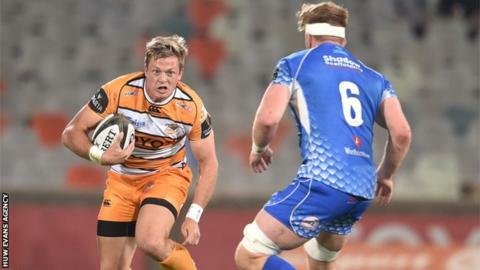 Cheetahs fly-half Tian Schoeman scored 18 points to help his side to a bonus-point win over Dragons. Henco Venter scored on the stroke of half-time before tries from Shaun Venter, Schoeman, Louis Fouche and Rabz Maxwane in a dominant second half. Taine Basham got Dragons' only try, while Josh Lewis kicked eight points. Dragons missed out on the chance to leapfrog Southern Kings in Conference B, while Cheetahs remain sixth in Conference A. A Schoeman penalty gave Cheetahs an early lead in Bloemfontein before his opposite number Lewis levelled the score. After an even contest, the teams looked destined to go into the break at 3-3 before number eight Henco Venter tore through the visitors' defence for the first of Cheetahs' five tries. Dragons came out firing in the second half with Wales Under-20s flanker Basham taking advantage of a quick tap penalty to bring the scores back level. The Welsh region then took the lead with a Lewis penalty after Cheetahs prop Luan de Bruin was shown a yellow card for repeat offences at the scrum. Poor defending meant Dragons failed to capitalise on the extra man and it was Cheetahs who went on the ascendency, with scrum-half Venter gliding past defenders before stretching for the line. Schoeman got in on the try-scoring action to add to an already impressive points haul, and was lining up another conversion attempt when replacement centre Fouche made sure of the bonus point. Prolific try scorer Maxwane added his name to the score sheet after finding himself in the right place at the right time to bag his 14th of the season.